Looking for objects for your museum? Does your museum have a list of de-accessioned objects to share with MPMA members? Posted items must be owned by the posting museum and no longer relate to it's mission. Items must have been approved for de-accessioning by the museum's director. Lists are posted for two months. MOR’s goal is to locate a new home for these objects with the intent that they will help further the mission of another institution or organization. Please do not wait, as these lists will expire on August 1, 2019. The City of Greeley Museums has produced another list of newly deaccessioned or retired items offered unconditionally with the instructions to dispose of them as is practical, preferably to another institution or cultural organization. 1. Non-relevance: Any artifact no longer relevant or compatible with the City of Greeley Museums’ mission statement may be disposed of properly. 2. Maintenance: Any artifact that cannot be properly stored, preserved or used in a professional manner to insure its integrity may be disposed of. This situation may result from undue size, excessive quantities of similar artifacts, fragility, or other unique circumstances. If you see a group of items, or even a single item that is of interest to you, please contact me as instructed in the link above. It should be noted that interested parties must make arrangements to retrieve items, or will be responsible for the cost of shipping. Our mission with these items now is to locate a new home for them with the intent that they will help further the mission of that Institution or Organization. Please do not wait, though, as this list will expire on June 30th, 2019 and we hope to hear from you soon! BUYERS: Looking for a bargain? Contact the seller directly. Items to be posted must be owned by the selling museum. Please submit a jpeg (72-96 dpi) and description of the actual item, purchase price, contact information and shipping details. Send to director@mpma.net and we will post your listing. Items will be posted for 2 months. 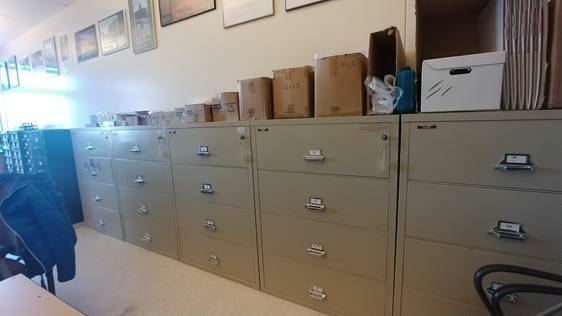 The Office of the Wyoming State Archaeologist is looking to sell some of their Fire King cabinets, located on campus in the Department of Anthropology, University of Wyoming, Laramie, WY. All are in good-to-excellent condition, have keys, and range in age from 3-7 years old. Only condition is that the buyer picks them up! We have hands and carts to help load but transport and unloading is up to you.